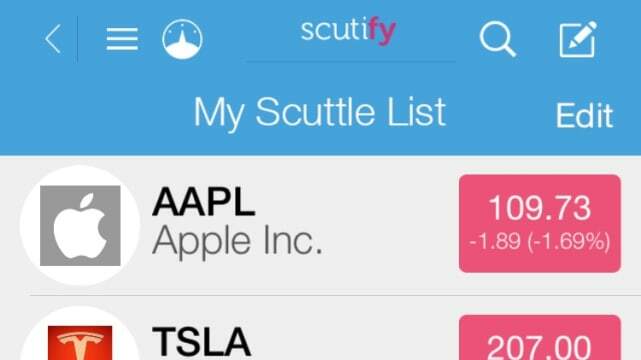 Scutify is a combination of many things, but it's mainly a social network built around the stock market. Monitor your important stocks and their current prices, get into trading and investing and chat about them with other members of Scutify. Post questions or status updates called "scuttles" to get the conversation going, which look like long, intelligent tweets. The app also integrates with Tradier Brokerage for investors to do what they do best and Twitter. Scutify is free for iPhone and iPad and requires iOS 7.0 or later. 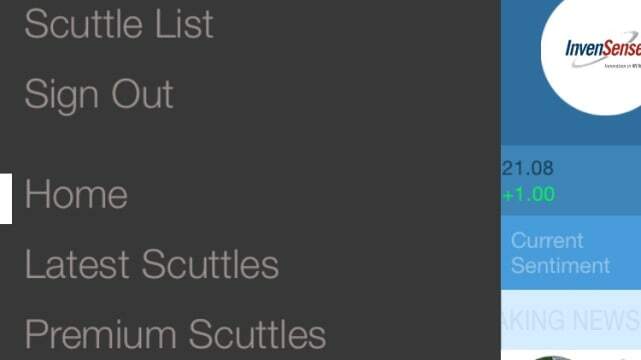 If you stare at Scutify for too long on your iPhone, your brain actually starts to hurt. Trending company logos at the top, a scrolling stock ticker underneath, investors' current opinions of the market, latest scuttles, plus a cluster of navigation options - it's a lot to take in. It feels like a software representation of all the chaos happening on CNBC during just about any program. The app is never void of content because right off the bat, Scutify appears to follow popular accounts at random. It feels weird at first but makes sense rather than just having a blank feed until you follow people. Above these latest scuttles from people are statistics about the market. Companies that are trending, an interactive stock ticker, and what's called the Scutify Sentiment giving a general consensus on whether stocks and the community surrounding them are bullish or bearish. 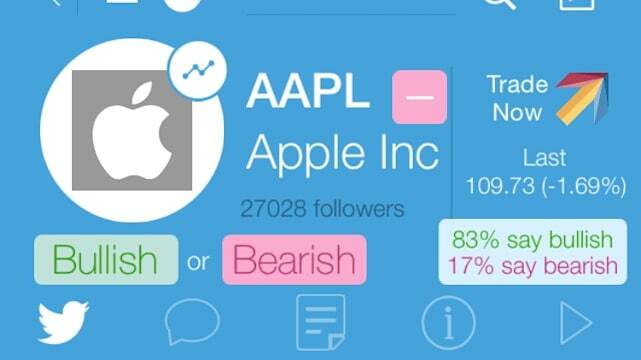 If you tap a stock, the app brings up detailed information about its current price and pulls in relevant tweets and news articles. Use the search tool at the top to search for any stock in the United States, United Kingdom, Australia, Canada or India. You also get your own profile by tapping what appears to be a Dashboard icon at the top to view your own scuttles, track your follower account, see tweets relevant to the stocks you follow and more. To post a new scuttle, tap the New Post icon and type up to 500 characters with or without an image. The slide-in menu does absolutely nothing to consolidate an already disorderly app. Menu options here are Latest Scuttles, Premium Scuttles, Companies, Commodities, All-Star Users, Latest Articles, Trending 20 Index, Scutify's separate Sentiment app and that's not even the entire list. I'm drowning in everything Scutify is trying to pile into this app. To make matters worse, the navigation is just as confusing as it is cluttered. "My Dashboard," something that normally refers to a home screen is actually your profile while "Home" is for your Home screen. Also, Latest Scuttles displays a list of posts from other users, "My Scuttle List" is a list of stocks you're following. Are scuttles stocks or posts? The breadth of features Scutify offers investors and business enthusiasts in its app is extraordinary. In fact, I haven't even scratched the surface of what it's capable of. Unfortunately, I don't think anyone would ever be able to efficiently or effectively browse through the entirety of Scutify without yearning for some fresh outside air or a glass of wine by the time they close the app. Far too much is going on to the point that it's just plain difficult to use. At least on the iPad app, Scutify has more room to work with and does take great advantage of the larger display to showcase all of its features. Ultimately though if you're looking for a stock trading app, keep browsing until you find one that doesn't give you a headache.